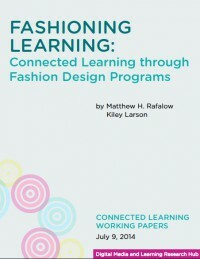 This analysis of Cali Design and Hive Fashion allows us to examine connected learning practices among youth in two environments that cater to an interest in fashion. It pushes us to appreciate how contexts may differently employ digital media to achieve important academically oriented outcomes, including skills with math, design, and teamwork, as well as technical skills with video and audio recording and editing technology. Both cases also illustrate how youth learn digital media literacies centered on curation and presentation to varied audiences, both in face-to-face environments and in online platforms. While Cali Design instructors did not see their work as inherently “techie,” they used digital tools such as Polyvore to augment their design lessons by providing opportunities to learn tuned to the skill level of the participants. They also used digital media to connect intergenerational audiences to the everyday learning practices of the program. Hive Fashion made explicit its goal to use and teach proficiencies with digital media technology. Participants pursued fashion-centered projects that often relied on the development of skills with video and audio recorders, image editing programs such as Adobe Illustrator, and advanced video editing applications such as Final Cut Pro. It is important that these cases show that with the right supports, connected learning environments can exist across a variety of contexts, including those that may resemble classes or programs offered in many schools. Both cases also provide examples of learning environments that have strong peer supports, a production focus, and a shared sense of purpose and community. These characteristics make them ideal connected learning environments, and they provide examples of how other programs may be similarly successful while serving a wide range of youth audiences across gender, race, and class.